A1 Steak Sauce 5 oz. Trust A1 steak sauce to spice up your plate, no matter what you make! This versatile, popular sauce offers quality flavor and brand recognition every time it's served. It's made with a classic blend of tomatoes, spices, vinegar, seasonings, and raisin paste to make up its rich brown color and slightly tangy taste. Pour this sauce over juicy steaks prepared to perfection or use it to season tender chicken and pork dishes. It can even be used to add a dash of bold flavor to your signature dips and marinades! This 5 oz. 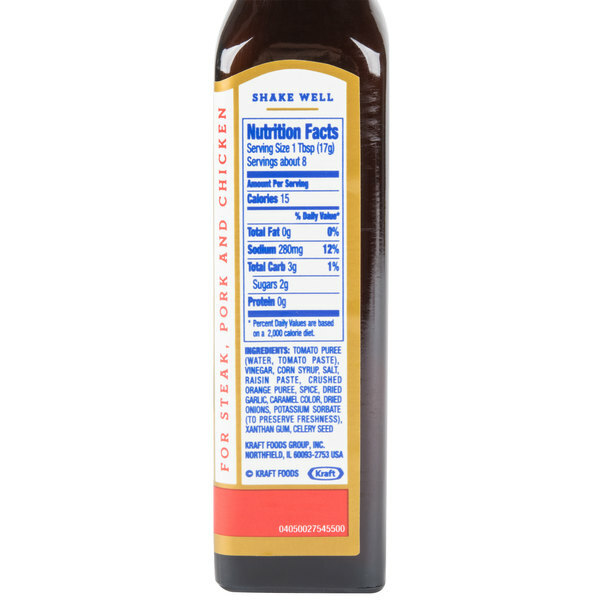 bottle of A1 steak sauce makes a great addition to your restaurant or steakhouse. With its convenient size, you can offer this sauce as is at the table so your patrons can help themselves and season their dishes to their liking. The glass bottle offers a classic look, while the resealable cap keeps the product fresh. 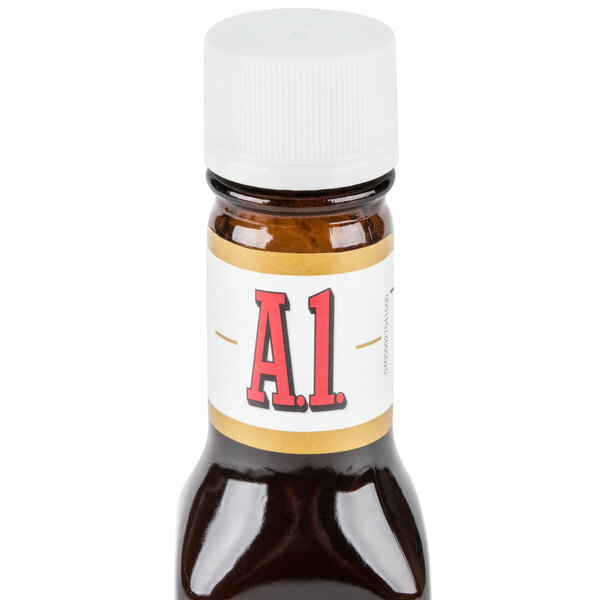 Whether you use it for burgers, meatloaf, or other entrees, A1 steak sauce provides a quick and easy way to spice up the flavor of any dish! Overall User Rating: A1 Steak Sauce 5 oz. A1 Steak Sauce is a favorite in our house. We use it in cooking, with all kinds of meats. It makes a terrific marinade, bringing out the flavor in any cut of beef. And, it's the number one choice as a condiment with any kind of steak. We love A1. 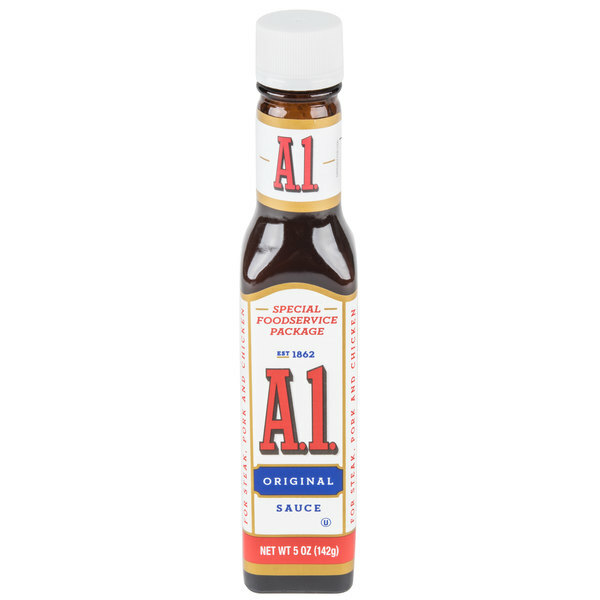 A1 steak sauce has such a great flavor. It is perfect for steak, fish, chicken, vegetables, etc... It's a favorite. A brand everyone knows and loves! A very good sauce for steaks or even chicken if you are bold. It tastes a little watery with a molasses tastes, some salt and good peppery kick. It seems to pack a lot of different spices and can be used as substitute for barbecue if you prefer something less sweet and more spicy. this is the classic steak sauce that pretty much everyone i know is used to and loves. its great for steak or chicken or even just on vegetables. it's worth every penny. A1 Steak Sauce is the only sauce I use for my steaks excellent flavor, great taste and worth every penny. 5 stars out of 5. You have got to love the classic tang of A1 steak sauce. I like to add a splash on mashed potatoes. My dad mixes it with italian dressing for a tasty, savory dressing! Love me some A1 steak sauce. The only steak sauce that is worth having in our diner. A great price for a case of these bottles. A1 steak sauce is such a classic additive to any steak dish! I love being able to purchase one of my favorite sauces from this site! 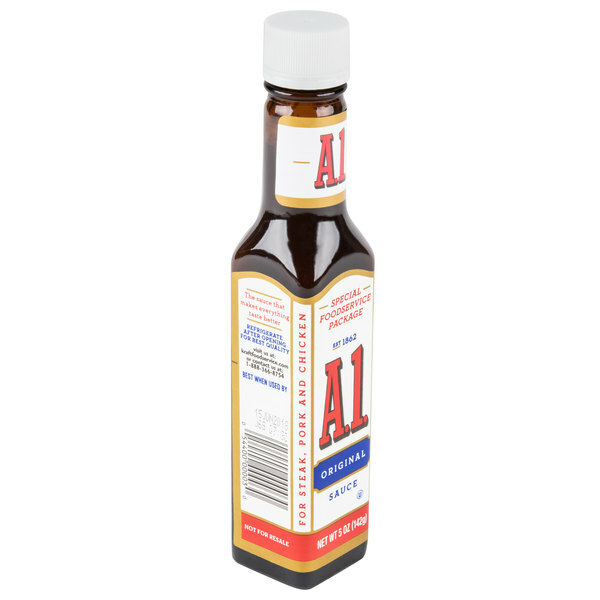 The case of A1 steak sauce is a great buy and the product is wonderful. The only steak sauce we use with our catering business. The bottles are the perfect size for serving at each table. 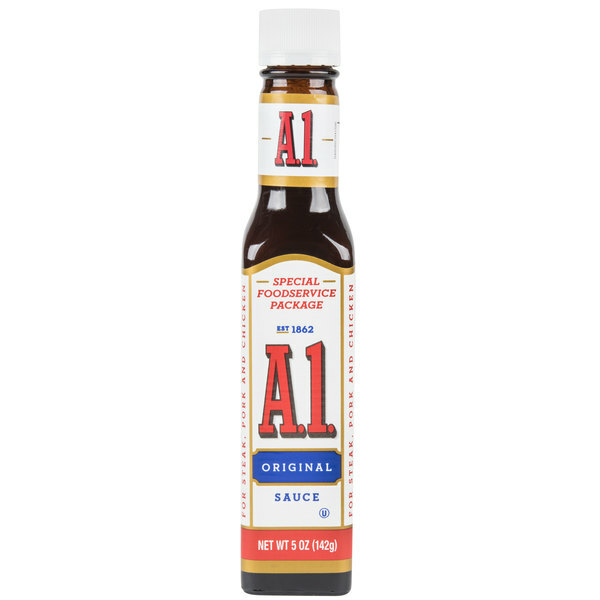 A1 is the best steak sauce! It’s rich flavor is a perfect addition to a delicious steak. The glass bottle is durable and a great value for the price. 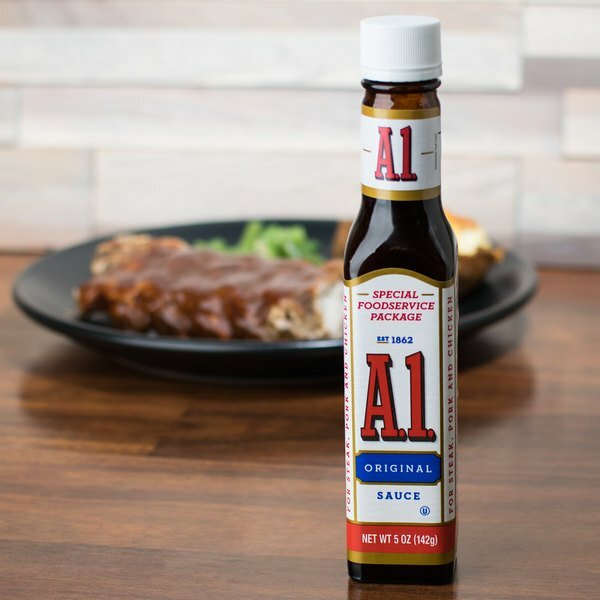 Since A1 Steak sauce is essential in restaurant we are pleases that we can purchase this staple through the Webstaurant Store! Thanks for making buying supplies easy! The A1 Steak Sauce is excellent. Its very good on steaks, hamburgers and for dipping breads. A good quality steak sauce at a really good price. This A1 Steak Sauce ten ounce sauce is a crowd pleaser for sure. I have completely eliminated all other brands from our restaurant and have never been questioned by any customer. The shelf life is perfect for our regular use and just try beating this great combination of peppers and spices. Will order again for sure. Also, I can’t say enough about the helpful and accommodating customer service rep.
A-1 has always been one of my favorite condiments! This product has always lived up to its value and always goes great with steak! The only issue is this small bottle doesn’t last too long. It may work best with one of the refil containers, but you’d need a small funnel to keep from spilling it. Otherwise definitely a great purchase! The best steak sauce to have on your tables at your steak house. A1 is well known and loved by all and the case is a great price. A1 deserves the recognition it gets. It is worth the higher price because it's flavor is unbeatable. I've never had anything quite like it and will continue to use it. Quality product!